Didn't get that Fitbit you wanted during the holidays but still yearning to utilize its activity tracking powers in time for a New Year's Resolution? There's an iPhone 5S app for that. The San Francisco startup company updated its stat-tracking iOS app today with a new feature called MobileTrack in version 2.1. "With MobileTrack, iPhone 5S users can now experience the power and accuracy of Fitbit right on your smartphone," said the app's official release notes on iTunes. The app uses the "the M7 coprocessor to track your basic activity," negating the need for the user to buy or carry around one of the company's motion-tracking gadgets. Fitbit isn't the first activity tracking company to take advantage of Apple's M7 coprocessor through an app. Running-focused rival Nike released its Nike+ Move app in early November, making good on its promise to utilize the M7 processor during the iPhone 5S unveiling in September. 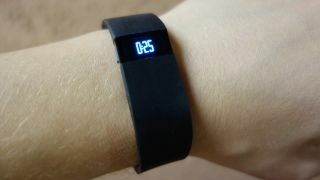 The Nike+ Move app converts movement to the sneaker company's proprietary NikeFuel measurement without the need for a Nike FuelBand SE. The Fitbit app, on the other hand, sticks to tracking steps, miles, floors and calories. Its use of the M7 processor and all of iPhone 5S sensors isn't as fool-proof as wearing the Fitbit Force that you'll never put down as you would a phone. Still, it's a pedometer step in the right direction to opening up the fitness tech craze to more resolution-ready quantified selfers.